BANGKOK • Witnesses said downtown Bangkok was a scene of carnage after a bomb exploded and scattered human flesh and body parts in the heart of the capital. 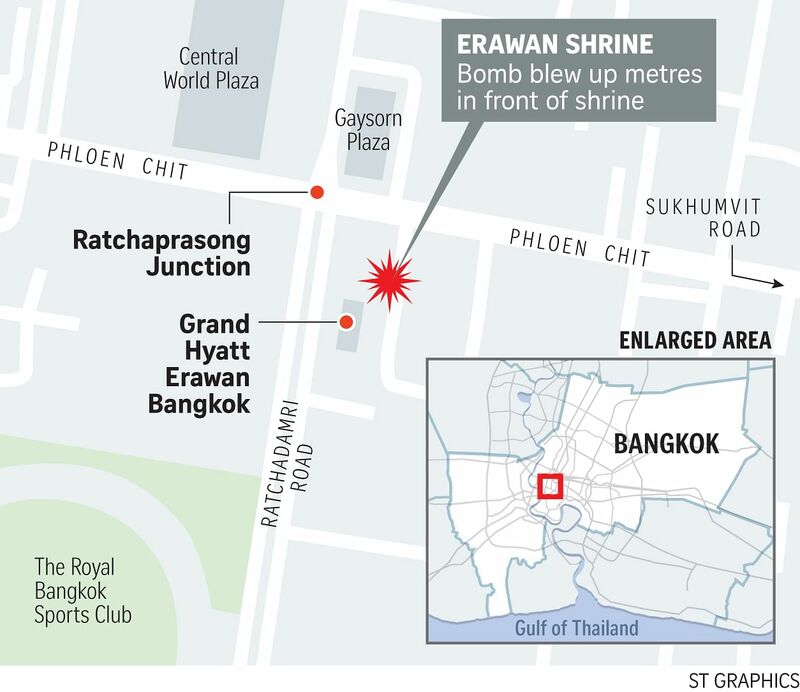 The blast during the evening rush hour, just outside the Erawan Shrine at the Ratchaprasong intersection, killed at least 16 people and wounded dozens, including foreigners. "When I arrived, they had already cleared the bodies from the ground outside the Erawan Shrine but there were, and there are, still pieces of human flesh strewn around the intersection," a witness, Mr Alessandro Ursic, told the BBC last night. "It's really graphic," he said. Another witness, Mr Richard Srikureja, said: "I was walking to a mall right next to the shrine and I heard a huge blast and people were just sprinting everywhere. It was total chaos and it's right in the middle of Bangkok." He added: "A local hotel is full of the injured. I saw a family that was bleeding badly. Everyone was trying to help as much as they could. Other people were taking photos." It was a TNT bomb... the people who did it targeted foreigners and to damage tourism and the economy. A local hotel is full of the injured. I saw a family that was bleeding badly. Everyone was trying to help as much as they could. Other people were taking photos. The Thai authorities placed white cloth over parts of bodies ripped apart by the explosion at the intersection, the same area where a protest that stretched for months was dispersed by the military in 2010. Bloodstains could be seen on the second storey of one of the shopping malls in the area, a measure of the power of the explosion. Glass was strewn across the street after the explosion outside the shrine in the central Chidlom district. Charred and shattered motorcycles littered the scene, along with hunks of concrete from the Hindu shrine, with pools of blood on the pavement. Thailand's Defence Minister condemned the bombing, which he said had targeted foreigners to try to damage the vital tourism industry. "It was a TNT bomb... the people who did it targeted foreigners and to damage tourism and the economy," Mr Prawit Wongsuwan said. After the blast, the Thai authorities stepped up security checks at some major city intersections and in tourist areas. The government would set up a "war room" to coordinate the response to the blast, the Nation television channel quoted Prime Minister Prayut Chan-o-cha as saying. Thailand has been seared by a near-decade of political violence that has left the country deeply divided and seen repeated rounds of deadly street protests and bombings - but none on yesterday's scale. The army has ruled Thailand since May last year, when it ousted an elected government after months of at-times-violent anti-government protests. Many Thai people also worship there.